The TObject class provides default behaviour and protocol for all objects in the ROOT system. It provides protocol for object I/O, error handling, sorting, inspection, printing, drawing, etc. 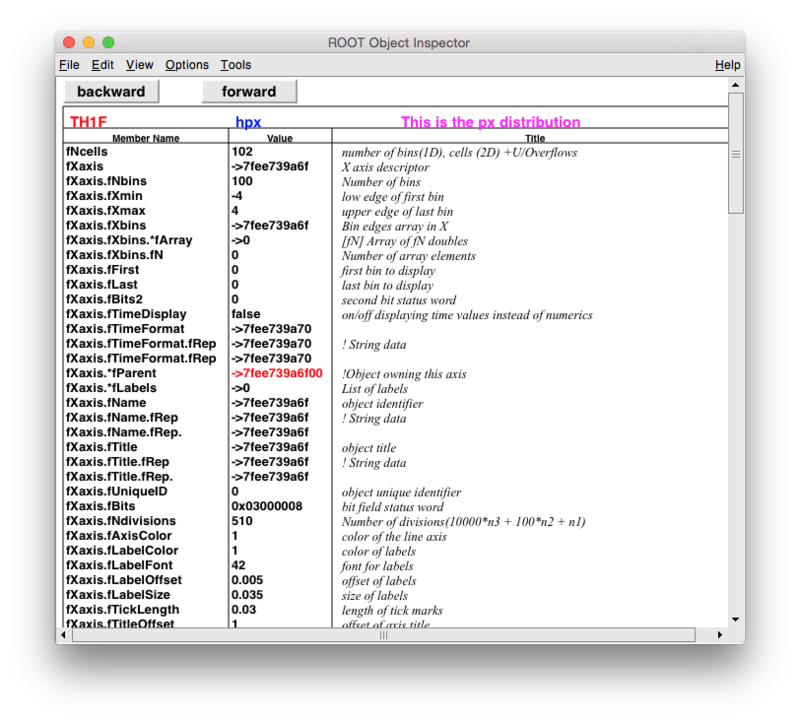 Every object which inherits from TObject can be stored in the ROOT collection classes. TObject's bits can be used as flags, bits 0 - 13 and 24-31 are reserved as global bits while bits 14 - 23 can be used in different class hierarchies (watch out for overlaps). Definition at line 37 of file TObject.h. Inherited by Hit, Jet, JetEvent, Memstat::TMemStatMng, MonitoredTFileInfo, PyROOT::TMemoryRegulator, RooAbsCollection, RooAbsIntegrator, RooCatType, RooCFunction1Ref< VO, VI >, RooCFunction2Ref< VO, VI1, VI2 >, RooCFunction3Ref< VO, VI1, VI2, VI3 >, RooCFunction4Ref< VO, VI1, VI2, VI3, VI4 >, RooCmdConfig, RooExpensiveObjectCache, RooGrid, RooHashTable, RooLinkedList, RooMinimizer, RooMinuit, RooMsgService, RooNameSet, RooNumGenConfig, RooNumGenFactory, RooNumIntConfig, RooNumIntFactory, RooSetPair, RooSharedProperties, RooSharedPropertiesList, RooSimPdfBuilder, RooStats::AcceptanceRegion, RooStats::HistFactory::EstimateSummary, RooStats::HistFactory::HistoToWorkspaceFactory, RooStats::HistFactory::HistoToWorkspaceFactoryFast, RooStats::MetropolisHastings, RooStats::ProposalFunction, RooStats::ProposalHelper, RooStats::SamplingSummary, RooStats::SamplingSummaryLookup, ROOT::Detail::TSchemaRuleSet, ROOT::Experimental::TTreeReaderFast, ROOT::Internal::TCheckHashRecursiveRemoveConsistency, ROOT::Internal::TTreeReaderDescriptor, ROOT::R::TRDataFrame, ROOT::R::TRFunctionExport, ROOT::R::TRFunctionImport, ROOT::R::TRInterface, ROOT::R::TRObject, ROOT::TSchemaRule, RooThreshEntry, RooWorkspace::CodeRepo, TAliEnFind, TApplication, TArchiveFile, TArchiveMember, TASPaletteEditor::PaintPalette, TAuthenticate, TAxisModLab, TBinomialEfficiencyFitter, TBits, TBox, TBuffer, TBuffer3D, TClassDocInfo, TClassGenerator, TClassMenuItem, TClassTable, TCollection, TCondition, TConditionImp, TCondor, TCondorSlave, TConfidenceLevel, TDataSetManager, TDecayChannel, TDecompBase, TDictAttributeMap, TDimensionInfo, TDNDData, TDocMethodWrapper, TDocOutput, TDocParser, TDrawFeedback, TEllipse, TEntryListBlock, TEnv, TEnvRec, TEveCluster, TEveFrameBox, TEveGeoNode, TEveGridStepper, TEveHit, TEveMCRecCrossRef, TEventIter, TEveRecCascade, TEveRecKink, TEveRecTrackT< TT >, TEveRecTrackT< Float_t >, TEveRecV0, TEveRGBAPalette, TEveTrans, TEveVSD, TExMap, TF1AbsComposition, TFeldmanCousins, TFileCacheRead, TFileCacheWrite, TFileMerger, TFilePrefetch, TFoam, TFoamCell, TFoamIntegrand, TFoamMaxwt, TFoamVect, TFormLeafInfo, TFPBlock, TFractionFitter, TFree, TFTP, TGClient, TGDMLParse, TGDMLRefl, TGDMLWrite, TGDNDManager, TGedFrame::TGedSubFrame, TGedTabInfo, TGenPhaseSpace, TGeoBatemanSol, TGeoBoolNode, TGeoBranchArray, TGeoBuilder, TGeoCacheState, TGeoChecker, TGeoDecayChannel, TGeoElementTable, TGeoExtension, TGeoGlobalMagField, TGeoHelix, TGeoIteratorPlugin, TGeoNavigator, TGeoNodeCache, TGeoPatternFinder, TGeoPolygon, TGeoTabManager, TGeoVoxelFinder, TGFrameElement, TGGC, TGHtmlElement, TGHtmlImage, TGHtmlLayoutContext, TGHtmlUri, TGIdleHandler, TGItemContext, TGLAutoRotator, TGLayoutHints, TGLayoutManager, TGLCamera, TGLLightSet, TGLPShapeObj, TGMainFrame::TGMapKey, TGMenuEntry, TGMime, TGMimeTypes, TGObject, TGPicture, TGPicturePool, TGraph2DPainter, TGRectMap, TGRegion, TGrid, TGridCollection, TGridJDL, TGridJob, TGTextEditCommand, TGTextLayout, TGUnknownWindowHandler, TGWin32CallBackObject, TH2PolyBin, THLimitsFinder, THnChain, THnIter, THnSparseArrayChunk, THostAuth, THtml, THtml::TFileSysEntry, THtml::THelperBase, THttpCallArg, TIconBoxThumb, TImagePalette, TImagePlugin, TInetAddress, TInspectorObject, TJSONStackObj, TKDTree< Index, Value >, TKDTreeBinning, TKSocket, TLDAPEntry, TLDAPResult, TLDAPServer, TLegendEntry, TLimitDataSource, TLine, TLockFile, TLockPath, TLorentzRotation, TLorentzVector, TMapFile, TMarker, TMarker3DBox, TMatrixTBase< Element >, TMatrixTLazy< Element >, TMatrixTSymLazy< Element >, TMCParticle, TMCVerbose, TMemStat, TMemStatShow, TMergerInfo, TMethodCall, TMLPAnalyzer, TMonitor, TMrbSubevent_Caen, TMultiLayerPerceptron, TMutexImp, TMVA::DataInputHandler, TMVA::DataSetFactory, TMVA::DataSetInfo, TMVA::DataSetManager, TMVA::Event, TMVA::Experimental::ClassificationResult, TMVA::MsgLogger, TMVA::OptionBase, TMVA::PDEFoam, TMVA::PDEFoamCell, TMVA::PDEFoamDensityBase, TMVA::PDEFoamKernelBase, TMVA::PDEFoamVect, TMVA::Results, TMVA::RootFinder, TMVA::TNeuron, TMVA::TreeInfo, TMVA::TSynapse, TMVA::VariableTransformBase, TNamed, TNDArray, TNotifyLinkBase, TObjectRefSpy, TObjectSpy, TObjectTable, TObjString, TOptionListItem, TOutputListSelectorDataMap, TPackageDescription, TPacketizer::TFileNode, TPacketizer::TFileStat, TPacketizerAdaptive::TFileNode, TPacketizerAdaptive::TFileStat, TPacketizerFile::TIterObj, TPainter3dAlgorithms, TPair, TParameter< AParamType >, TParameter< Long64_t >, TParticle, TPBHandleDSType, TPBHistType, TPBReadType, TPerfEvent, TPluginHandler, TPluginManager, TPoints3DABC, TPolyLine, TPolyLine3D, TPolyMarker, TPolyMarker3D, TPrimary, TProofBench, TProofBenchDataSet, TProofBenchRun, TProofNodeInfo, TProofNodes, TProofPerfAnalysis::TWrkEntry, TProofProgressInfo, TProofProgressStatus, TProofResources, TPyDispatcher, TQpDataBase, TQpLinSolverBase, TQpProbBase, TQpResidual, TQpSolverBase, TQpVar, TQSlot, TQuaternion, TQueryDescription, TQueryResultManager, Track, TRatioPlot, TRealData, TRecEvent, TRecorder, TRecWinPair, TRef, TRefTable, TRobustEstimator, TRolke, TRootBrowserHistoryCursor, TRootSnifferStore, TRotation, TRWLock, TS3HTTPRequest, TSecContext, TSecContextCleanup, TSelector, TSemaphore, TSessionDescription, TSlave, TSlaveInfo, TSpectrum2Transform, TSpider, TSplinePoly, TSPlot, TSQLClassColumnInfo, TSQLClassInfo, TSqlCmdsBuffer, TSQLColumnData, TSQLObjectData, TSQLObjectDataPool, TSQLObjectInfo, TSqlRawBuffer, TSqlRegistry, TSQLResult, TSQLRow, TSQLServer, TSQLStatement, TSQLStructure, TSQLTableData, TStatistic, TStatsFeedback, TStopwatch, TStreamerInfoActions::TActionSequence, TStreamerInfoActions::TConfiguredAction, TSVDUnfold, TSynapse, TSysEvtHandler, TThreadImp, TTreeDrawArgsParser, TTreeFormulaManager, TTreeReader, TTVRecord, TTVSession, TUnfold, TUri, TUrl, TUsrHit, TUsrHitBuffer, TVector2, TVector3, TVectorT< Element >, TVectorT< Double_t >, TView, TVirtualFFT, TVirtualGeoConverter, TVirtualGeoPainter, TVirtualGeoTrack, TVirtualGraphPainter, TVirtualHistPainter, TVirtualMCDecayer, TVirtualMCStack, TVirtualPacketizer, TVirtualPacketizer::TVirtualSlaveStat, TVirtualPad, TVirtualPerfStats, TVirtualProofPlayer, TVirtualTreePlayer, TVirtualViewer3D, TXMLAttr, TXMLDocument, TXMLEngine, TXMLNode, TXMLParser, TXMLPlayer, and TXMLStackObj. Definition at line 76 of file TObject.h. Definition at line 86 of file TObject.h. Definition at line 71 of file TObject.h. Definition at line 57 of file TObject.h. It sets the two data words of TObject to their initial values. The unique ID is set to 0 and the status word is set depending if the object is created on the stack or allocated on the heap. Depending on the ROOT environment variable "Root.MemStat" (see TEnv) the object is added to the global TObjectTable for bookkeeping. Definition at line 226 of file TObject.h. Definition at line 244 of file TObject.h. Removes object from all canvases and object browsers if observer bit is on and remove from the global object table. Definition at line 79 of file TObject.cxx. Use this method to implement an "abstract" method that you don't want to leave purely abstract. Definition at line 922 of file TObject.cxx. Private helper function which will dispatch to TObjectTable::AddObj. Included here to avoid circular dependency between header files. Definition at line 96 of file TObject.cxx. Append graphics object to current pad. In case no current pad is set yet, create a default canvas with the name "c1". Definition at line 105 of file TObject.cxx. Browse object. May be overridden for another default action. Reimplemented in TProof, TRecorder, TF1, TClass, TTree, ROOT::Internal::THnBaseBrowsable, THnBase, TROOT, TH1, TGeoManager, TBranchElement, RooPlot, TRatioPlot, TPad, TBranch, TGenerator, TCollection, TStyle, TCollectionPropertyBrowsable, TMultiDimFit, TCanvas, TDirectory, TPair, TQueryResult, TGeoVolume, TApplicationRemote, TASImage, TEfficiency, TLeaf, TGraph, TGraph2D, TTreePerfStats, TMapFile, TChain, TDatabasePDG, TGeoNode, TGeometry, TGeoOverlap, TKey, TDirectoryFile, TParticleClassPDG, TGeoTrack, TBaseClass, TNode, THStack, TPrincipal, TAlienDirectory, TAlienJobStatus, TAxis3D, TSPlot, TSystemDirectory, TTask, TMultiGraph, TBranchObject, TRemoteObject, TAlienMasterJobStatus, TProofChain, TBranchClones, TFolder, TMacro, THbookFile, TNtuple, TNtupleD, TAlienMasterJob, TVirtualBranchBrowsable, TAlienDirectoryEntry, TSystemFile, THbookBranch, THbookKey, TBranchSTL, and TKeyMapFile. Definition at line 119 of file TObject.cxx. Check and record whether this class has a consistent Hash/RecursiveRemove setup (*) and then return the regular Hash value for this object. (*) The setup is consistent when all classes in the class hierarchy that overload TObject::Hash do call ROOT::CallRecursiveRemoveIfNeeded in their destructor. i.e. it is safe to call the Hash virtual function during the RecursiveRemove operation. Definition at line 299 of file TObject.h. Definition at line 128 of file TObject.cxx. Reimplemented in TGHtml, TGeoHMatrix, TGeoGenTrans, TGeoCombiTrans, ROOT::v5::TFormula, TLinearFitter, TGeoRotation, TStreamerInfo, TFormula, TPad, TVectorT< Element >, TVectorT< Double_t >, TCollection, TMatrixTBase< Element >, TVirtualStreamerInfo, TMultiDimFit, TBits, TCanvas, TDirectory, TMatrixT< Element >, TMatrixT< Double_t >, TMatrixT< AReal >, TGTextEntry, TMatrixTSparse< Element >, TMatrixTSparse< Double_t >, TGTextView, TGraph2D, TMatrixTSym< Element >, TMatrixTSym< Double_t >, TProofProgressLog, TProcessID, TGView, TGTextEdit, TFumili, JetEvent, TList, TListOfEnums, TBtree, RooLinkedList, TRefTable, TVirtualPad, TMVA::ResultsMulticlass, TRefArray, TProofProgressMemoryPlot, TMap, TListOfDataMembers, TMVA::ResultsRegression, TVirtualFitter, THashTable, TOrdCollection, TMVA::ResultsClassification, TObjArray, TBackCompFitter, TListOfFunctions, TListOfFunctionTemplates, TPrincipal, TTask, TMVA::MinuitWrapper, TViewPubDataMembers, TViewPubFunctions, ROOT::TSchemaRule, TClonesArray, TMrbSubevent_Caen, TFolder, THashList, TEventList, TListOfEnumsWithLock, TNotifyLinkBase, TFitter, TBranchRef, TNamed, TDictAttributeMap, TPaveText, TLegend, and TUsrHitBuffer. Definition at line 100 of file TObject.h. If the object derives from TNamed, this function is called by TNamed::Clone. TNamed::Clone uses the optional argument to set a new name to the newly created object. If the object class has a DirectoryAutoAdd function, it will be called at the end of the function with the parameter gDirectory. This usually means that the object will be appended to the current ROOT directory. Reimplemented in TClass, TH1, TStreamerInfo, TMinuit, TCollection, TImage, TASImage, TMethodCall, TH2Poly, RooAbsArg, RooDataSet, TMVA::MinuitWrapper, RooDataHist, TMethod, RooStats::ModelConfig, RooCmdArg, TFunction, RooFitResult, RooLinkedList, TNamed, RooCatType, RooAbsStudy, RooAbsCollection, RooStudyPackage, TFunctionTemplate, RooCategoryProxy, RooAbsBinning, RooFormula, RooRealProxy, RooNameSet, RooMapCatEntry, and RooThreshEntry. Definition at line 144 of file TObject.cxx. Must be overridden if a class wants to be able to compare itself with other objects. Must return -1 if this is smaller than obj, 0 if objects are equal and 1 if this is larger than obj. Reimplemented in RooAbsArg, TSlaveInfo, TCollection, TDSetElement, TSlave, TEnvRec, TGeoBranchArray, TFileInfo, TParameter< AParamType >, TParameter< Long64_t >, TUrl, TClassDocInfo, TGeoOverlap, TPerfEvent, RooDouble, TNamed, TObjString, RooInt, and RooThreshEntry. Definition at line 159 of file TObject.cxx. Reimplemented in TH1D, TH1F, TH1I, TH1S, TH1C, TF1, TH3D, TH2D, TH3F, TH2F, TH3I, ROOT::v5::TFormula, TH2I, TH3S, TH1, TFile, TFormula, TH2S, TH3C, TStyle, TH2C, TDirectory, TLatex, TProfile3D, TAxis, TProfile2D, TProfile, TF2, TF3, TF1NormSum, TF1Convolution, TH3, TGTextEdit, TSystemDirectory, TDirectoryFile, THelix, TH2, TGTextView, TSystemFile, TPolyMarker3D, TPolyLine3D, TFolder, TPolyMarker, TPolyLine, TArrow, TBox, TNamed, TAxis3D, TEllipse, TLine, TMathText, TPave, TPaletteAxis, TColor, TText, TH1K, TMarker, TLegend, TF12, TArc, TWbox, TLegendEntry, TPaveLabel, TXTRU, TPaveClass, TF1AbsComposition, TCrown, and TFrame. Definition at line 61 of file TObject.cxx. Typically called as a command via the interpreter. Normally use "delete" operator when object has been allocated on the heap. Reimplemented in TTree, TGFrame, TFile, TTreeViewer, TCollection, TDirectory, TCanvas, TThread, TProtoClass, TGTextEdit, TAxis, TQCommand, TMVA::Results, TList, TListOfEnums, TBtree, RooLinkedList, TDirectoryFile, TSystemDirectory, TExMap, TKey, TMap, TRefArray, THashTable, TListOfDataMembers, TObjArray, TOrdCollection, TListOfFunctions, TListOfFunctionTemplates, TSystemFile, TObjectTable, TViewPubDataMembers, TViewPubFunctions, TClonesArray, TKeySQL, THashList, TListOfEnumsWithLock, TGItemContext, and TKeyXML. Definition at line 169 of file TObject.cxx. This member function must be implemented for each graphics primitive. This default function returns a big number (999999). Reimplemented in TF1, TGLViewer, TH1, TParticle, TGenerator, TStyle, TGeoConeSeg, TGeoTubeSeg, TPad, TGeoVolume, TASImage, TGeoShape, TAxis, TGraph, TEfficiency, TSpider, TGraph2D, TF2, TGeoXtru, TGraphPolargram, TF3, TTreePerfStats, TGLScenePad, TParallelCoord, TGLParametricEquation, TGeoNode, TGeoPgon, THistPainter, TGeoOverlap, TGeoPcon, TMarker3DBox, TGLHistPainter, TParallelCoordVar, TGeoTrack, TNode, TPCON, TTUBE, TSPHE, TGeoHype, TGeoTorus, TPie, TAxis3D, THStack, TGeoCompositeShape, TColorWheel, TPrimary, TMultiGraph, TGeoTube, TFileDrawMap, TGeoVGShape, TPolyMarker3D, TPolyLine3D, TParallelCoordRange, TPolyMarker, TSpline, TGeoCone, TPolyLine, TBox, TPaletteAxis, TGeoSphere, TPave, TGeoBBox, TEllipse, TLine, TTUBS, TCurlyLine, TText, TGeoScaledShape, TMarker, TGLTH3Composition, TGeoParaboloid, TGeoShapeAssembly, TCurlyArc, TBRIK, TGL5DDataSet, TVirtualHistPainter, TGeoHalfSpace, TPoints3DABC, TXTRU, TGeoEltu, TPieSlice, TCrown, and TDiamond. Definition at line 186 of file TObject.cxx. Reimplemented in TTreeViewer, TXSocket, TThread, TXSlave, and TSlaveLite. Definition at line 841 of file TObject.cxx. Default Draw method for all objects. Reimplemented in TF1, TTree, TClass, TGeoBatemanSol, TGListTree, TDSet, TH1, TFile, TPad, TMatrixTBase< Element >, TVectorT< Element >, TVectorT< Double_t >, TRatioPlot, TCollection, TGenerator, TMultiDimFit, TFITSHDU, TDirectory, TCanvas, TGeoVolume, TEveGeoTopNode, TGeoShape, TMultiLayerPerceptron, TASImage, RooTreeDataStore, TGeoPainter, TGraph, TEfficiency, TGraphPolargram, TGraph2D, TSpider, TF2, TF3, TChain, TTreePerfStats, TEveGeoNode, TParallelCoord, TVirtualPad, TGeoNode, TVirtualGeoPainter, TGeoParallelWorld, TGeoOverlap, TGeometry, THelix, TGeoPhysicalNode, RooAbsData, RooStats::HypoTestInverterPlot, TParallelCoordVar, TGeoTrack, TNode, TGeoVGShape, TClassTree, TPie, RooPlot, THStack, TColorWheel, TGPicture, TProofChain, RooStats::SamplingDistPlot, TMultiGraph, TPolyMarker3D, RooStats::HybridPlot, TPolyLine3D, TParallelCoordRange, TGeoPolygon, TGraphTime, TPolyMarker, TSpline, TPolyLine, TArrow, TBox, TPave, TEllipse, TGItemContext, TPaveText, TMarker, TGraphPolar, TLegend, TNodeDiv, TButton, TWbox, TPaveLabel, TDiamond, TPavesText, and TFrame. Definition at line 195 of file TObject.cxx. Reimplemented in TGFrame, TSystemDirectory, and TSystemFile. Definition at line 210 of file TObject.cxx. Draw a clone of this object in the current selected pad for instance with: gROOT->SetSelectedPad(gPad). Reimplemented in TGFrame, TCanvas, TAxis, TSystemDirectory, and TSystemFile. Definition at line 219 of file TObject.cxx. Reimplemented in TClass, TGFrame, TCollection, TGPack, and TSystemFile. Definition at line 266 of file TObject.cxx. Use "location" to specify the method where the error occurred. Accepts standard printf formatting arguments. Definition at line 880 of file TObject.cxx. Reimplemented in TInterpreter, TContextMenu, and TMethodCall. Definition at line 277 of file TObject.cxx. Reimplemented in TContextMenu, TMethodCall, and TInterpreter. Definition at line 295 of file TObject.cxx. Execute action corresponding to an event at (px,py). This method must be overridden if an object can react to graphics events. Reimplemented in TGeoManager, TF1, TH1, TGLViewer, TParticle, TGenerator, TGeoVolume, TPad, TGeoShape, TASImage, TGraph, TAxis, TEfficiency, TF2, TSpider, TGraphPolargram, TGraph2D, TF3, TCanvas, TTreePerfStats, TGLScenePad, TView3D, TParallelCoord, TGeoNode, TGLParametricEquation, THistPainter, TGeoOverlap, TGLEventHandler, TGLHistPainter, TParallelCoordVar, TMarker3DBox, TNode, TGeoTrack, TPie, TAxis3D, TPrimary, TFileDrawMap, TASPaletteEditor::LimitLine, TPolyMarker3D, TPolyLine3D, TParallelCoordRange, TPolyMarker, TPolyLine, TSpline, TBox, TPave, TEllipse, TLine, TPaletteAxis, TText, TCurlyLine, TMarker, TGLTH3Composition, TView, TCurlyArc, TGL5DDataSet, TVirtualHistPainter, TButton, TWbox, TSliderBox, TCrown, TGroupButton, TDiamond, TFrame, and TLink. Definition at line 311 of file TObject.cxx. Use "location" to specify the method where the fatal error occurred. Accepts standard printf formatting arguments. Definition at line 908 of file TObject.cxx. Must be redefined in derived classes. This function is typically used with TCollections, but can also be used to find an object by name inside this object. Reimplemented in TH1, TROOT, TPad, TCollection, TDirectory, TGraph, TGraph2D, TList, TObjArray, TBtree, RooLinkedList, TMap, TGeometry, TListOfDataMembers, THashTable, TListOfFunctions, TListOfFunctionTemplates, THbookFile, TFolder, THashList, TListOfEnumsWithLock, TViewPubDataMembers, TViewPubFunctions, and TListOfTypes. Definition at line 321 of file TObject.cxx. This function is typically used with TCollections, but can also be used to find an object inside this object. Reimplemented in TH1, TROOT, TPad, TCollection, TDirectory, TGraph, TGraph2D, TList, TObjArray, TBtree, RooLinkedList, TMap, TGeometry, THashTable, TListOfFunctions, THbookFile, TFolder, THashList, TListOfEnumsWithLock, TViewPubDataMembers, and TViewPubFunctions. Definition at line 331 of file TObject.cxx. Note that before calling object.GetDrawOption(), you must have called object.Draw(..) before in the current pad. Reimplemented in TFitEditor, TRootBrowser, TRootBrowserLite, TBrowser, TGFileBrowser, and TGedFrame. Definition at line 341 of file TObject.cxx. Definition at line 969 of file TObject.cxx. Returns mime type name of object. Used by the TBrowser (via TGMimeTypes class). Override for class of which you would like to have different icons for objects of the same class. Reimplemented in TGMainFrame, TBranch, TBranchElement, TGeoVolume, TMethodBrowsable, TASImage, TKey, TSystemFile, and TVirtualBranchBrowsable. Definition at line 367 of file TObject.cxx. This default method returns the class name. Classes that give objects a name should override this method. Reimplemented in TMVA::MethodBase, TGMenuTitle, TGeoDecayChannel, TPad, TSlaveInfo, TSessionServerFrame, RooAbsCollection, TCollection, TParticle, TPackageDescription, TVirtualPacketizer::TVirtualSlaveStat, TSessionDescription, TProofBenchRunDataRead, TVirtualPad, TProofBenchRunCPU, TGeoShape, TGWindow, TSlave, TQueryDescription, TPair, TMVA::PDF, TMVA::Reader, THtml::TFileSysEntry, TEnvRec, TGLSAViewer, TPBHandleDSType, TMVA::Factory, TGMenuEntry, TTreePerfStats, TQCommand, TMCParticle, TMVA::VariableTransformBase, RooLinkedList, TQConnection, TMapFile, TArchiveMember, TGaxis, TTVSession, TGeoVGShape, TPBHistType, TMVA::FitterBase, TParameter< AParamType >, TParameter< Long64_t >, TMVA::DataSetInfo, TGPicture, TMVA::OptionBase, TPackMgr, TProofNodeInfo, TClassDocInfo, TPrimary, TPolyMarker3D, TSQLColumnData, TPave, TRealData, TVirtualGeoTrack, TEveGeoNode, TPaletteAxis, TStatistic, TPBReadType, TTVRecord, TSQLClassInfo, TDrawFeedback, TDocDirective, TNamed, TGLEmbeddedViewer, RooCatType, TStatsFeedback, TObjString, TOutputListSelectorDataMap, TLockPath, TGLPShapeObj, TXMLAttr, and TSQLClassColumnInfo. Definition at line 357 of file TObject.cxx. This method is typically overridden by classes of which the objects can report peculiarities for different positions. Returned string will be re-used (lock in MT environment). Reimplemented in TF1, TH1, TGeoVolume, TASImage, TF2, TGeoNode, TParallelCoordVar, TAxis3D, TGLParametricEquation, THistPainter, TNode, TGLHistPainter, TGeoTrack, TColorWheel, TFileDrawMap, TPaletteAxis, TGLTH3Composition, TVirtualHistPainter, and TGL5DDataSet. Definition at line 386 of file TObject.cxx. Definition at line 954 of file TObject.cxx. Reimplemented in TH1, TFile, TGeoVolume, TSocket, TMapFile, TGaxis, TUDPSocket, TAxis3D, THelix, TNode, TPolyMarker3D, TSelector, TPolyLine3D, TPolyLine, TPolyMarker, TPave, TArrow, TPSocket, TPoints3DABC, and TLegendEntry. Definition at line 120 of file TObject.h. This default method returns the class title (i.e. description). Classes that give objects a title should override this method. Reimplemented in TGGroupFrame, TPad, TGTextButton, TParticle, TGTextEntry, TVirtualPad, TAxis, TPair, TGTextLBEntry, TGLVEntry, TASImage, TQCommand, TParallelCoordSelect, TMapFile, TGaxis, TGLabel, TKey, TEvePointSet, TPackMgr, TClassMenuItem, TBaseClass, TPrimary, TEveGeoNode, TNamed, and TPaveLabel. Definition at line 401 of file TObject.cxx. Definition at line 375 of file TObject.cxx. Execute action in response of a timer timing out. This method must be overridden if an object has to react to timers. Reimplemented in TGHtml, TSessionViewer, TProofPlayerSuperMaster, TProofPlayerSlave, TProofPlayerRemote, TGPopupMenu, TTreeViewer, TGuiBldDragManager, TGTextEntry, TGFileContainer, TGDNDManager, TGTextView, TGScrollBar, TGTextEdit, TVirtualPacketizer, TGWindow, TGShutter, TGTextEditor, TGLEventHandler, TGToolTip, TGCommandPlugin, and TProofPlayerLite. Definition at line 411 of file TObject.cxx. Error in <ROOT::Internal::TCheckHashRecursiveRemoveConsistency::CheckRecursiveRemove>: The class SomeName overrides TObject::Hash but does not call TROOT::RecursiveRemove in its destructor. Reimplemented in TPad, TCollection, TPair, THtml::TFileSysEntry, TEnvRec, RooLinkedList, TParameter< AParamType >, TParameter< Long64_t >, TClassDocInfo, TGPicture, TPave, TStatistic, TDrawFeedback, TNamed, TGObject, TStatsFeedback, TObjString, RooSetPair, and TImagePlugin. Definition at line 433 of file TObject.cxx. Return true is the type of this object is known to have an inconsistent setup for Hash and RecursiveRemove (i.e. missing call to RecursiveRemove in destructor). Definition at line 333 of file TObject.h. Use "location" to specify the method where the warning occurred. Accepts standard printf formatting arguments. Definition at line 854 of file TObject.cxx. Definition at line 443 of file TObject.cxx. Definition at line 451 of file TObject.cxx. Same action as Dump but in a graphical form. In addition pointers to other objects can be followed. Reimplemented in TGFrame, and TSystemFile. Definition at line 464 of file TObject.cxx. Definition at line 174 of file TObject.h. Default equal comparison (objects are equal if they have the same address in memory). More complicated classes might want to override this function. Reimplemented in TSlaveInfo, TPair, TQCommand, TGObject, and TObjString. Definition at line 483 of file TObject.cxx. Returns kTRUE in case object contains browsable objects (like containers or lists of other objects). Reimplemented in TProof, TTree, TClass, TROOT, ROOT::Internal::THnBaseBrowsable, TPad, THnBase, TBranch, TBranchElement, TGeoManager, TMultiDimFit, TCollection, TCanvas, TGeoNodeMatrix, TDirectory, TGeoVolume, TPair, TGeoNode, TApplicationRemote, TMapFile, TGeometry, TKey, TAxis3D, TGeoOverlap, TNode, TDatabasePDG, TGeoTrack, THbookFile, TPrincipal, TTask, TBaseClass, TParticleClassPDG, TBranchObject, TFolder, TSPlot, TAlienDirectory, TAlienJobStatus, TBranchClones, TRemoteObject, TSystemDirectory, TAlienMasterJobStatus, TVirtualBranchBrowsable, TAlienDirectoryEntry, THbookKey, and TBranchSTL. Definition at line 473 of file TObject.cxx. Definition at line 133 of file TObject.h. Reimplemented in RooAbsArg, TSlaveInfo, TCollection, TDSetElement, TSlave, TUri, TGeoBranchArray, TFileInfo, TParameter< AParamType >, TParameter< Long64_t >, TUrl, TClassDocInfo, TGeoOverlap, TPerfEvent, TPave, TNamed, RooDouble, TObjString, RooInt, and RooThreshEntry. Definition at line 131 of file TObject.h. Definition at line 134 of file TObject.h. The ls function lists the contents of a class on stdout. Ls output is typically much less verbose then Dump(). Reimplemented in TClass, TStreamerSTL, TROOT, TPad, TFile, TStreamerInfo, TCollection, TStreamerBase, TCanvas, TDirectory, TVirtualStreamerInfo, TVirtualPad, TStreamerElement, TGeoNode, TApplication, TQUndoManager, TGFrameElement, TChain, TFTP, TQConnection, TMCParticle, TParameter< AParamType >, TParameter< Long64_t >, TGLayoutHints, TDirectoryFile, TMapFile, TGeometry, ROOT::TSchemaRule, TKey, TQCommand, TNode, TStatistic, THStack, THbookFile, TTask, TColor, TClassTree, TChainElement, TFunction, TPolyMarker3D, TPave, TText, ROOT::Detail::TSchemaRuleSet, TFriendElement, TPolyLine3D, TFolder, TBox, TPolyMarker, TEllipse, TPolyLine, TLine, TNamed, TMarker, TFree, and TProofOutputList. Definition at line 492 of file TObject.cxx. Definition at line 49 of file TObject.h. Use this method to signal that a method (defined in a base class) may not be called in a derived class (in principle against good design since a child class should not provide less functionality than its parent, however, sometimes it is necessary). Definition at line 933 of file TObject.cxx. This method must be overridden to handle object notification. Reimplemented in TTree, TIdleTOTimer, TReaperTimer, TShutdownTimer, TGLRedrawTimer, TProofServLogHandler, h1analysis, TProcessEventTimer, TTreeReader, TBranchElement, TProofInputHandler, TThreadTimer, TTreeFormula, TProofInterruptHandler, TCollection, TStdExceptionHandler, TViewTimer, TSignalHandler, TARInterruptHandler, TASLogHandler, TSelEvent, TSelectorDraw, TNotifyLink< Type >, TNotifyLink< ROOT::Detail::TBranchProxy >, TNotifyLink< TTreeReader >, TProofDraw, TTimer, TRefTable, TFileHandler, TSelVerifyDataSet, TTreeFormulaManager, h1analysisTreeReader, TLeafObject, TSelEventGen, TMessageHandler, TSelector, TSelectorEntries, TSelHandleDataSet, TXSocketHandler, TPySelector, TSysEvtHandler, TBranchRef, and RooProofDriverSelector. Definition at line 506 of file TObject.cxx. Use this method to declare a method obsolete. Specify as of which version the method is obsolete and as from which version it will be removed. Definition at line 942 of file TObject.cxx. Definition at line 985 of file TObject.cxx. Definition at line 996 of file TObject.cxx. Definition at line 152 of file TObject.h. Definition at line 154 of file TObject.h. Definition at line 153 of file TObject.h. Definition at line 155 of file TObject.h. Definition at line 271 of file TObject.h. The difference between Paint() and Draw() is that when a object draws itself it is added to the display list of the pad in which it is drawn (and automatically redrawn whenever the pad is redrawn). While paint just draws the object without adding it to the pad display list. 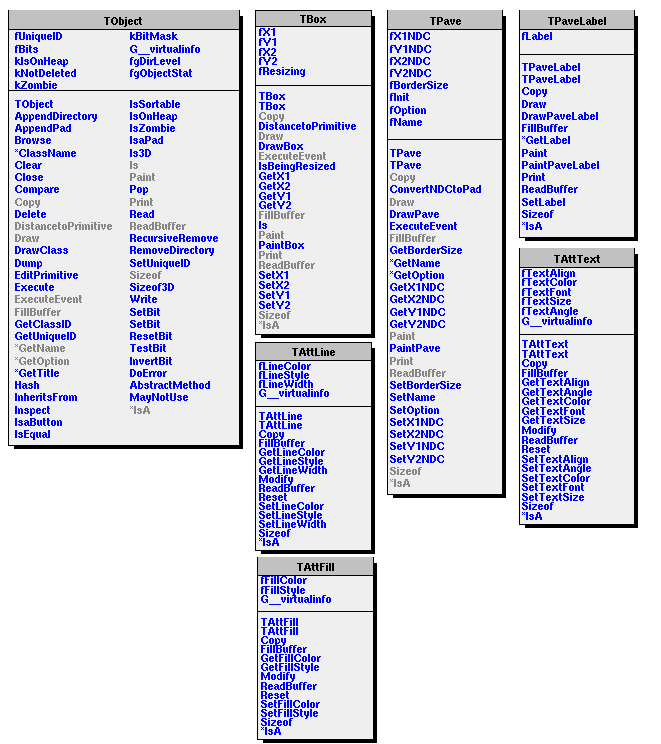 Reimplemented in TF1, TH1, TStyle, TPad, TFile, TSQLFile, TGeoSubtraction, TCollection, TCanvas, TGenerator, TRatioPlot, TDirectory, TParticle, TGeoIntersection, TGraph, TVirtualPad, TGeoShape, TBits, TGeoPainter, TEveDigitSet, TGraph2D, TGeoNode, TGeoVolume, TGeoUnion, TEfficiency, TEveGeoTopNode, TF2, TLatex, TEveStraightLineSet, TSpider, TVirtualGeoPainter, TF3, TASImage, TTreePerfStats, TParallelCoord, TGaxis, TParallelCoordVar, TGeoVGShape, TGeoPhysicalNode, THistPainter, TPie, TEvePointSet, TAxis3D, TGeoBoolNode, TNode, TGeoOverlap, TXMLFile, TGraph2DPainter, TEveCaloViz, TGLParametricEquation, TEveArrow, TMultiGraph, TEveShape, TPrimary, TEveText, TEveTriangleSet, THStack, TGLHistPainter, TGeoTrack, TMarker3DBox, TEveProjectionAxes, TVirtualGeoTrack, TClassTree, TPolyMarker3D, TEveScene, TPave, TText, TColorWheel, TPolyLine3D, TPolyMarker, TFileDrawMap, TASPaletteEditor::LimitLine, TBox, TPolyLine, TShape, TParallelCoordRange, TEllipse, TSpline, TLegend, TLine, TPaveText, TPaletteAxis, TArrow, TEveGeoShape, TEvePlot3D, TMacro, TGraphTime, TGraphPolargram, TMathText, TSpectrum2Painter, TASPaletteEditor::PaintPalette, TMarker, TVirtualHistPainter, TGLTH3Composition, TWbox, TGL5DDataSet, TPaveStats, TButton, TNodeDiv, TSlider, TExec, TPaveLabel, TCrown, TDiamond, TPavesText, and TFrame. Definition at line 519 of file TObject.cxx. Pop on object drawn in a pad to the top of the display list. I.e. it will be drawn last and on top of all other primitives. Reimplemented in TPad, TVirtualPad, and TFrame. Definition at line 528 of file TObject.cxx. Reimplemented in TProof, TF1, TTree, TGCompositeFrame, TGeoElementTable, TH1, TGeoBatemanSol, TPad, TGFrame, TProofServ, RooAbsArg, TGeoDecayChannel, TGFontPool, RooStats::ModelConfig, TLorentzVector, TFile, THnBase, ROOT::v5::TFormula, TSlaveInfo, TSQLFile, TFormula, TBranch, TDSet, TBranchElement, TGFont, TStreamerInfoActions::TActionSequence, TPluginManager, TGeoBorderSurface, TGeoElementRN, TCollection, TMultiDimFit, TRolke, TZIPMember, TMatrixTBase< Element >, TQpVar, TVector3, TVirtualPad, TVectorT< Element >, TVectorT< Double_t >, TPluginHandler, TDirectory, TProofDesc, TParticle, TGeoSkinSurface, TDecompSparse, TSQLStructure, RooAbsCollection, TEnv, TGraph, RooAbsData, RooMsgService, TTreeCache, TEveTrans, TTreeCacheUnzip, TFileInfoMeta, TSlave, TQueryResult, RooWorkspace, TZIPFile, TBits, TGGCPool, TMonaLisaWriter, TGraph2D, TGeoOpticalSurface, TGeoVolume, TChain, TGFrameElement, TDSetElement, RooPlot, TGeoIsotope, TGPicturePool, TGWindow, TMVA::TNeuron, TProofOutputFile, TUri, TProofBenchRunDataRead, TQpDataDens, TQpDataSparse, TXNetFile, TGeoBranchArray, TParameter< AParamType >, TApplicationRemote, TParameter< Long64_t >, TQuaternion, TParticlePDG, TProofLite, TGeoVoxelFinder, TProofLogElem, TTreePerfStats, TGGC, TFileCacheRead, TVector2, TMVA::PDEFoamCell, THostAuth, TProofBenchRunCPU, TFileInfo, TGLayoutHints, TGTextEdit, TMapFile, TUrl, TParallelCoordVar, TMemFile, TAlienCollection, TGeoMatrix, RooCatType, TKey, TGeoElement, TDecompBase, TAliEnFind, TClassTable, TSecContext, TFTP, TGraphBentErrors, RooLinkedList, TGeoPhysicalNode, TDecompSVD, TGeoOverlap, TXMLFile, RooAbsDataStore, TFileCollection, TMultiGraph, TFoamCell, TInetAddress, TGraphAsymmErrors, TDecompQRH, TGridCollection, TGeoTrack, TPrimary, TDatabasePDG, THStack, TGPicture, TPrincipal, TStatistic, TSelEventGen, THelix, TDecompLU, TCondor, TProofProgressStatus, TGMimeTypes, TGraphErrors, RooNumIntConfig, TPave, TText, RooCustomizer, RooAbsBinning, TPolyMarker3D, TDecompBK, RooFitResult, TTreeIndex, TColor, TAttParticle, RooFormula, TPerfEvent, TPolyLine, TPolyLine3D, TPolyMarker, TDecompChol, TMVA::PDEFoamVect, TObjectTable, TBox, RooHist, TEventList, TGeoRegion, TEllipse, TSpectrum, TProofLog, TParallelCoordRange, TLine, RooCurve, TBranchObject, TMessageHandler, TFunction, TLegend, TParticleClassPDG, TProofBenchRun, TStatus, TPaveText, TStopwatch, TGraph2DErrors, TBranchClones, TNamed, TProofNodes, RooAbsNumGenerator, TNetFile, RooStats::HistFactory::EstimateSummary, TMacro, TSQLColumnInfo, TFitResult, TMarker, TXTRU, TAlienJobStatus, TSlaveLite, Roo1DTable, RooGenFitStudy, THbookTree, TLDAPEntry, TXNetFileStager, RooAbsGenContext, RooNumGenConfig, TBenchmark, TGDMLMatrix, TRootSecContext, TSpectrum3, TSpectrum2, TAlienMasterJobStatus, TAlienResult, TNetFileStager, TBranchRef, RooNameSet, TCondorSlave, TObjString, TLDAPAttribute, TLDAPResult, TFoamVect, TFileCacheWrite, TProofOutputList, TBranchSTL, TSQLTableInfo, TAlienMasterJob, RooGrid, TLegendEntry, RooEllipse, and RooSharedProperties. Definition at line 550 of file TObject.cxx. First the key with the given name is searched in the current directory, next the key buffer is deserialized into the object. The object must have been created before via the default constructor. See TObject::Write(). Reimplemented in TKeyXML, TBuffer, TKey, and TKeySQL. Definition at line 562 of file TObject.cxx. Recursively remove this object from a list. Typically implemented by classes that can contain multiple references to a same object. Reimplemented in TTree, TH1, TPad, TROOT, RooAbsCollection, RooAbsData, TFitEditor, TH2Editor, TCollection, TVirtualPad, TDirectory, TH1Editor, TGraph, TRootBrowser, RooMCStudy, TRootBrowserLite, THistPainter, RooWorkspace, TChain, TFileMerger, TTreePlayer, TGedEditor, TList, TGeometry, TBrowser, TProcessID, TListOfFunctions, TListOfDataMembers, TListOfEnums, TObjArray, TNode, TGFileBrowser, RooLinkedList, ROOT::Internal::TCheckHashRecursiveRemoveConsistency, TMultiGraph, TListOfFunctionTemplates, TListOfEnumsWithLock, TViewPubDataMembers, TViewPubFunctions, THStack, TObjectRefSpy, THashList, TFolder, TLegend, TRootContextMenu, TObjectSpy, TInspectCanvas, TDialogCanvas, and PyROOT::TMemoryRegulator. Definition at line 572 of file TObject.cxx. Definition at line 171 of file TObject.h. Save this object in the file specified by filename. if "filename" contains ".root" the object is saved in filename as root binary file. if "filename" contains ".xml" the object is saved in filename as a xml ascii file. if "filename" contains ".cc" the object is saved in filename as C code independant from ROOT. The code is generated via SavePrimitive(). Specific code should be implemented in each object to handle this option. Like in TF1::SavePrimitive(). otherwise the object is written to filename as a CINT/C++ script. The C++ code to rebuild this object is generated via SavePrimitive(). The "option" parameter is passed to SavePrimitive. By default it is an empty string. It can be used to specify the Draw option in the code generated by SavePrimitive. The function is available via the object context menu. Reimplemented in TPad, TSpline5, TSpline3, TGeoVolume, TVirtualPad, TTreePerfStats, TClassTree, TFolder, TSpline, TGObject, and TPaveClass. Definition at line 599 of file TObject.cxx. Reimplemented in TGHtml, TGGroupFrame, TF1, TGTransientFrame, TGMainFrame, TGeoPatternSphPhi, TGeoPatternSphTheta, TGeoHMatrix, TGListTree, TGeoPatternSphR, TGHorizontalFrame, TGVerticalFrame, TGCompositeFrame, TGeoPatternCylPhi, TGeoIdentity, TStyle, TGeoPatternCylR, TGRadioButton, TGListBox, TGMenuBar, TH1, TGeoPatternTrapZ, TGeoCombiTrans, TGListDetailsLayout, TGCheckButton, TGeoPatternParaZ, TGListLayout, TGFrame, TSpline5, TGTileLayout, TGMenuTitle, TGNumberEntry, TGeoPatternParaY, TGeoDecayChannel, TGMatrixLayout, TGPictureButton, TGLVContainer, TGCanvas, TGeoPatternParaX, TSpline3, TGMdiMainFrame, TGColumnLayout, TGPopupMenu, TGTextButton, TGeoRotation, TGRowLayout, TGFont, TGeoCtub, TGeoVolume, TGeoElementRN, TGeoPatternZ, TASImage, TGeoSubtraction, TCanvas, TGDoubleHSlider, TGVScrollBar, TGFileContainer, TGHorizontalLayout, TGLineWidthComboBox, TGeoMixture, TGVerticalLayout, TGListView, TGHScrollBar, TGHSlider, TGTextEntry, TGDoubleVSlider, TGeoPatternY, TGeoGtra, TGeoConeSeg, TGraph, TGLineStyleComboBox, TGedPatternSelect, TGeoIntersection, TGColorSelect, TGeoTubeSeg, TGXYLayout, TGeoTranslation, TGVProgressBar, TGNumberEntryField, TGDockableFrame, TGVSlider, TGComboBox, TGVFileSplitter, TGraph2D, TGTextEdit, TGeoPatternX, TChain, TGeoTrap, TGContainer, TGSplitFrame, TGTripleHSlider, TProfile2D, TGHButtonGroup, TGTableLayout, TProfile3D, TPad, TGButton, TGHProgressBar, TGXYLayoutHints, TEfficiency, TGTextLBEntry, TGHSplitter, TProfile, TGeoUnion, TLatex, TF2, TGLabel, TGTab, TTreePerfStats, TGVButtonGroup, TGeoMaterial, TGTextView, TGeoXtru, TF3, TParallelCoord, TGShutter, TH2Poly, TGGC, TGLayoutHints, TGaxis, TGProgressBar, TGButtonGroup, TParallelCoordVar, TGeoPcon, TGTripleVSlider, TGeoPgon, TGVSplitter, TAxis3D, TGeoBoolNode, TPie, TGraphBentErrors, TGeoCone, TGFSComboBox, TGMdiFrame, TGeoBBox, TMultiGraph, TGeoHype, TGeoSphere, TGeoCompositeShape, TGeoTorus, TGeoArb8, TGraphAsymmErrors, TGeoTube, TGToolBar, THStack, TGeoPara, TGMdiMenuBar, THelix, TMarker3DBox, TGStatusBar, TGedMarkerSelect, TGraphErrors, TGeoTrd2, TPave, TText, TGeoTrd1, TPolyMarker3D, TRootEmbeddedCanvas, TGIcon, TGeoParaboloid, TGeoScaledShape, TGTableLayoutHints, TPolyLine, TPolyLine3D, TPolyMarker, TBox, TGShutterItem, TEllipse, TLegend, TLine, TPaveText, TGVertical3DLine, TCurlyLine, TGeoShapeAssembly, TArrow, TMacro, TPaletteAxis, TGeoEltu, TGeoHalfSpace, TMathText, TGTabLayout, TH1K, TGeoMedium, TMarker, TCurlyArc, TWbox, TF12, TCutG, TPaveStats, TButton, TGHorizontal3DLine, TGShapedFrame, TPaveLabel, TSlider, TArc, TExec, TSliderBox, TPieSlice, TPaveClass, TCrown, TDiamond, TFrame, TPavesText, and TGroupButton. Definition at line 664 of file TObject.cxx. Definition at line 694 of file TObject.cxx. Definition at line 170 of file TObject.h. Set drawing option for object. This option only affects the drawing style and is stored in the option field of the TObjOptLink supporting a TPad's primitive list (TList). Note that it does not make sense to call object.SetDrawOption(option) before having called object.Draw(). Reimplemented in TPad, TGFrame, TRootBrowserLite, TAxis, TBrowser, TGedFrame, RooPlot, TSystemDirectory, and TSystemFile. Definition at line 677 of file TObject.cxx. Definition at line 977 of file TObject.cxx. Definition at line 961 of file TObject.cxx. Definition at line 705 of file TObject.cxx. Use "location" to specify the method where the system error occurred. Accepts standard printf formatting arguments. Definition at line 894 of file TObject.cxx. Definition at line 172 of file TObject.h. Definition at line 173 of file TObject.h. Set current style settings in this object This function is called when either TCanvas::UseCurrentStyle or TROOT::ForceStyle have been invoked. Reimplemented in TTree, TH1, TPad, TGraph, TCanvas, TAxis3D, TPaveText, TPaveStats, and TFrame. Definition at line 715 of file TObject.cxx. Definition at line 866 of file TObject.cxx. Write this object to the current directory. For more see the const version of this method. Reimplemented in TTree, TFile, TSQLFile, TCollection, TDirectory, ROOT::Experimental::TBufferMergerFile, TDirectoryFile, TXMLFile, TMap, TBuffer, and TParallelMergingFile. Definition at line 785 of file TObject.cxx. The data structure corresponding to this object is serialized. The corresponding buffer is written to the current directory with an associated key with name "name". Creation of a support TKey object in the current directory. The TKey object creates a TBuffer object. The TBuffer object is filled via the class::Streamer function. If the file is compressed (default) a second buffer is created to hold the compressed buffer. Reservation of the corresponding space in the file by looking in the TFree list of free blocks of the file. The buffer is written to the file. Bufsize can be given to force a given buffer size to write this object. By default, the buffersize will be taken from the average buffer size of all objects written to the current file so far. If a name is specified, it will be the name of the key. If name is not given, the name of the key will be the name as returned by GetName(). The option can be a combination of: kSingleKey, kOverwrite or kWriteDelete Using the kOverwrite option a previous key with the same name is overwritten. The previous key is deleted before writing the new object. Using the kWriteDelete option a previous key with the same name is deleted only after the new object has been written. This option is safer than kOverwrite but it is slower. The kSingleKey option is only used by TCollection::Write() to write a container with a single key instead of each object in the container with its own key. An object is read from the file into memory via TKey::Read() or via TObject::Read(). The function returns the total number of bytes written to the file. It returns 0 if the object cannot be written. Reimplemented in TTree, TFile, TSQLFile, TCollection, TDirectory, TDirectoryFile, TXMLFile, TMap, TBuffer, and TParallelMergingFile. Definition at line 764 of file TObject.cxx. Definition at line 213 of file TObject.h. Definition at line 41 of file TObject.h. Definition at line 43 of file TObject.h. Definition at line 44 of file TObject.h. Definition at line 40 of file TObject.h. ROOT 6.17/01 - Reference Guide Generated on Fri Apr 19 2019 04:55:15 (GVA Time) using Doxygen 1.8.14.